The Iron Cross HD Bumper features a welded mandrel bent 2 in. diamater push bar mounted to the top of the bumper. This provides extra protection out on the road and aggressive styling. Laser cut 10 guage steel is welded together and cleaned up for greater structural integrity. This creates a light shell that's strong enough for any obstacle. All bumpers offer winch capability with the option of bolting up to a 12'000 lb winch to the bumper leaving you completely confident you wont be stranded off road. Iron Cross finished the HD Bumper with a unique textured gloss black finish. This durable finish will keep your bumper protected from the elements to minimize corrosion. Iron Cross HD push bar front bumpers are built for those that pursue to be the best and look the best. Iron cross front bumpers are not only built to make your truck look like a war machine, but they are built to protect you, your passengers, and your truck from damage. Iron Cross HD push bar front bumpers are proudly made in America with precious and one of a kind design. The HD push bar front bumper is crafted from CNC cut ten gauge steel that is fully welded. The design of Iron Cross bumpers allow for greater structural integrity and feature a light weight shell. Iron Cross HD push bar front bumpers are finished in textured black powder-coat and feature a winch mount that will accept 9,500 pound winches and several styles of 12, 500 pound winches. With a name like Iron Cross you cannot go wrong. Get yourself an American made Iron Cross HD push bar front bumper and make your truck the baddest rig on and off the road. Each Iron Cross bumper is custom made and built to fit your specific make and model of vehicle. Iron Cross truck bumpers are custom built for you and shipped freight, and production may take longer than expected. These bumpers are fully warrantied by Iron Cross, but are non-returnable. Please make sure you pick all the options you want at the time of order and they can't be added after production has started. If you have any questions, feel free to call RealTruck and we'll be happy to assist you to make sure you get exactly what you want. The Iron Cross HD push bar front bumper and the Iron Cross bumper light kit are backed by a limited lifetime warranty. 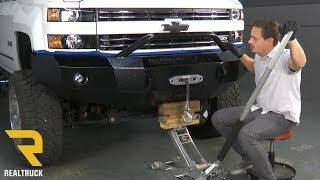 Iron Cross HD push bar front bumpers come with everything you'll need to install. 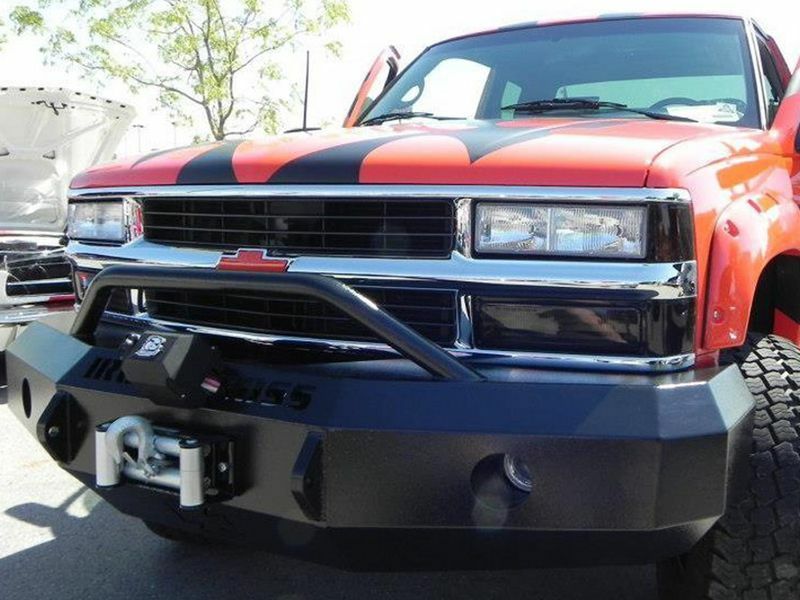 Iron Cross HD front bumpers are vehicle specific, allowing for a no-drill, no-cutting installation. If you have any questions, please give us a call at 877-216-5446.